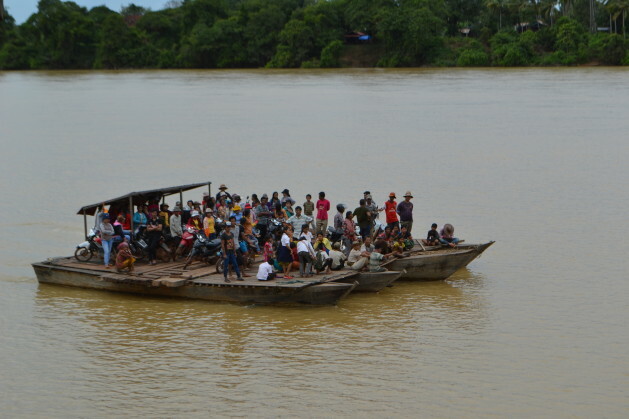 A ferry boat on the Sesan River. Credit: Michelle Tolson/IPS. That’s because there are few fish in the brown, murky waters of the river, and he can buy them cheap from bordering Vietnam. On the other hand, electricity – which the dam promises – is costly. “Electricity is expensive because the village doesn’t have it,” Ton tells IPS. Cambodia, among the least developed countries in Asia, lacks an electrical grid. Only 26 percent of the population has access to government-supplied electricity. The rest use private operators, generators, or have no electricity at all. Private operators charge consumers as much as 75 cents per kilowatt per hour. “Since the Vietnam dam was built, there have been less and less fish." Ton pays 15 dollars per month for electricity, using a battery and a generator – costly by the standards of a country where 49 percent of the 15 million population lives on two dollars a day or less. Villagers like him, therefore, think the hydropower project will end their power woes. But what Ton doesn’t know is that once the dam comes, the fish could become even more scarce, depriving Cambodians like him of their staple food and one of the most important sources of protein, say several NGOs. “No one consults with the local community. They just say, ‘We are going to bring electricity to you’,” Ame Trandem of the International Rivers NGO tells IPS. The government believes rural electrification is important “to reduce poverty, improve the standard of living and foster economic development,” as stated in a report earlier this year titled Rural Electrification Policies in Cambodia. The dam near Ton’s home is to be built at the junction of the Sesan and Srepok rivers. The two rivers converge about 25 km upstream from Stung Treng city and are joined by the Sesong river before merging with the Mekong, in what is called the 3S River Basin. Hydroelectric dams have been suggested as a resource for the electricity-hungry nation, and the declining fish catch has only helped support the cause of dams. During the famine in the 1970s, Cambodians did not have access to their staple protein – fish – due to government policies that forbade commercial fishing. This policy was also seen as contributing to the starvation and death of about two million people. It serves as an example for how dependent the country is on fish as a source of protein. With malnutrition rates in children in Laos and Cambodia as high as 40 percent, Baird thinks putting pressure on the limited resources is a dangerous option. Meach Mean, coordinator of the 3S Rivers Protection Network, says most tribal people living in the watershed don’t have access to information. The indigenous Tampuan people have historically not had a written language. A Laos-Tampuan himself, he experienced the consequences of dams after Vietnam built a hydropower dam upstream on Sesan at Yali Falls in 1996. Officials released water without notifying the communities downstream, causing numerous deaths and crop and livestock loss. The three other Lao men with him agree, though they all decline to give their name for fear of repercussions from the government. “We live in a remote area and people don’t know about us. Only 30 percent of the people here know about the dam. I hear about it from people further down the river,” he says. They doubt that the project will bring cheap power. Laos too is planning to build the Don Sahong dam on the Mekong river, just two kilometres from Cambodia’s border. The Mekong flows through a series of channels that become waterfalls before reaching Cambodia. While the Lao government seeks to harness energy from just one channel and sell it to either Cambodia or Thailand, the dam will rest on one of the only year-round transit points for fish migration that could jeopardise the food security of Lower Mekong. Baird says the government could jail villagers who speak against it. After a recent site visit to speak with engineers of the Lao project, Cambodian officials came away uneasy about the environmental impact and insisted the project be halted, according to Trandem. “The idea behind the Sesan dam was that Cambodia could benefit from its own dams,” says Trandem. Vietnam was to invest in the venture as a kind of payback for the suffering inflicted on them earlier, and buy electricity from Cambodia. But after an outcry from Cambodians, who thought Vietnam would benefit yet again at their expense, Prime Minister Hun Sen declared that all the power generated would go to Cambodia. “The problem is Cambodia has no way of using that electricity as it has no grid to transport it to the cities,” says Trandem. Laos has the advantage of having a basic electrical grid in place, as does Vietnam, in contrast with Cambodia.